I had the pleasure of attending REMTEC 2019 in Denver last week. As always it was great to catch up with colleagues and hear about new developments in our industry. While much of the discussion centered around the looming challenges of PFAS contamination, there were also many valuable presentations related to building reliable conceptual site models. Most inspiring to me personally are the continuing efforts to systematize the process of sustainably restoring heavily contaminated properties back to useful life. James Henderson with DuPont Corporate Remediation Group provided the benchmark process in his presentation of Harnessing the Value of Contaminated Lands to Achieve Global Environmental, Social and Economic Transformation. A leap forward in horizontal high-resolution was presented by Erik Piatt, with En Rx, and their Vertebrae Horizontal Well system. This system enables the practitioner to design the placement of individually isolated horizontal well screens for monitoring or injection beneath buildings and structures without entry into the facility. The value of high-resolution site characterization as a key step in remediation design or an effective diagnostic in performing remedial optimization was highlighted in multiple presentations. New technologies such of the Hydraulic Profiling Tool (HPT) and the HPT-GW groundwater profiler provide critical data on formation pore pressure to support any planning for fluid recovery or injection. The HPT can be combined with both the Membrane Interface Probe (MiHpt) or Optical Interface Probe (OIP-HPT) for delineation of storage and transport zones for VOCs and LNAPL. Call us (+1-888-344-2704) if you would like more information on these tools. I look forward to meeting new friends and seeing old ones at the upcoming Battelle International Symposium on Bioremediation and Sustainable Environmental Technologies in Baltimore, 15-18 April 2019. Shoot me a note if you're going to attend and let's connect. COLUMBIA Technologies Completes 20 Years of Service! COLUMBIA Technologies is excited to announce that we just passed our 20 year milestone in providing quality high-resolution site characterization services around the globe. Working with our partners in Brazil and Africa we have delivered over 2000 individual site characterization projects, providing real data, in real time, reliably to our consulting firm clients. THANK YOU to our clients, partners, and the many COLUMBIA Technologies team members who made achieving this milestone possible. We look forward to 2019 and beyond to offer a growing range of services to our global customers. Should Site Assessments Be Conducted Through Traditional Sampling, Groundwater Monitoring Wells, or Direct Sensing Methods? It is safe to say that 99% of all site assessments are either conducted through traditional sampling, groundwater monitoring wells, or direct sensing methods. As a leading site investigation partner to environmental consultants throughout North America and Hawaii, COLUMBIA Technologies specializes in soil and groundwater contamination assessments. Since 1999, we have completed over 750 site assessments for some of the most discriminating clients including oil companies, government agencies, commercial real estate owners, developers, as well as architectural and engineering firms. Throughout all of our testing and experiences to date, we believe that using a comprehensive High Resolution Vertical Profiling approach seems to be the most cost-effective and accurate method to assess a contaminated site. This consists of direct sensing technologies to delineate the vertical and horizontal extent of the contamination to pinpoint the location. Once this information is known, following up with confirmation soil and groundwater samples would take place to validate the contaminant of concern. The direct sensing technologies may cost more up front, however they assure that accurate information is being collected to move forward with designing remediation plans. In addition, our patented real-time data services platform, SmartData Solutions®, is able to produce high resolution visualizations through a secured website for online review of project data. COLUMBIA Technologies’ state-of-the-art equipment and rapid 3D visualizations combined with historical data completed a site assessment so efficiently that the original project work scope was reduced by 50%. On this recently completed project, a major energy company required state clearance from regulators prior to advancing their expansion plans at an active petroleum refinery facility in western North Dakota. Historical data indicated potential contamination in the expansion area requesting for rapid resolution to address regulatory concerns. The client engaged in a site assessment with COLUMBIA to map the area of concern and compare this with the historical data using COLUMBIA’s award winning SmartData Solutions®. With a dynamic work scope and real-time data measurement the team bound the area of concern and closed data gaps to reduce the problem at hand for the client as well as the regulatory agencies. 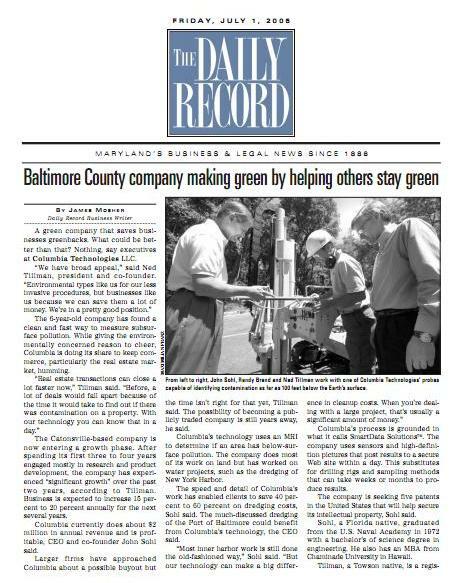 One of the companies in the new Maryland Clean Energy Incubator at the University of Maryland, Baltimore County is trying to make real estate development easier and faster. 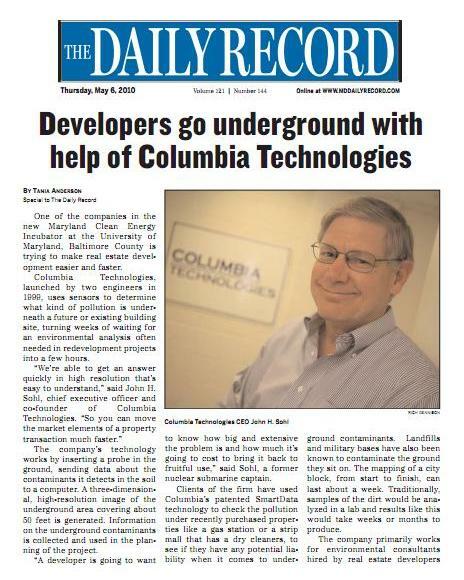 Columbia Technologies, launched by two engineers in 1999, uses sensors to determine what kind of pollution is underneath a future or existing building site, turning weeks of waiting for an environmental analysis often needed in redevelopment projects into a few hours. "We're able to get an answer quickly in high resolution that's easy to understand," said John H. Sohl, chief executive officer and co-founder of Columbia Technologies. "So you can move the market elements of a property transaction much faster." The company's technology works by inserting a probe in the ground, sending data about the contaminants it detects in the soil to a computer. 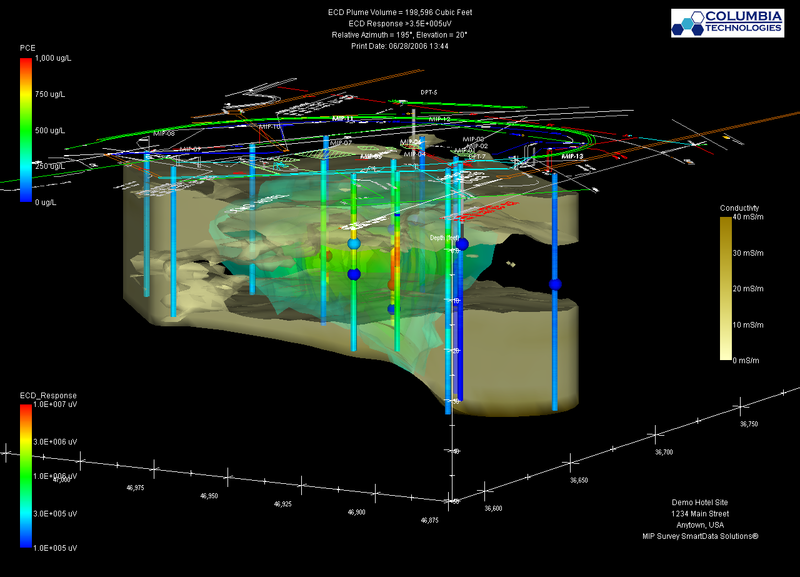 A three-dimensional, high-resolution image of the underground area covering about 50 feet is generated. Information on the underground contaminants is collected and used in the planning of the project. "A developer is going to want to know how big and extensive the problem is and how much it's going to cost to bring it back to fruitful use," said Sohl, a former nuclear submarine captain. A warehousing facility for an equipment manufacturer had undergone several rounds of investigation and remediation to determine the extent of TCE contamination. The distribution of TCE on this several acre site in Los Angeles County, CA, was strongly controlled by thin-layer geology. And after more than a decade of investigating, the extent of the contamination was still not fully understood. Long before the fieldwork began, Columbia Technologies, based in Baltimore, MD, worked closely with GeoTrans in Irvine, CA, the site consultant, to develop a scope of work that would allow Columbia Technologies to characterize the vertical distribution of TCE across the site in just a few days of fieldwork using the Membrane Interface Probe (MIP). "Of critical importance," according to Lauren Steely, Columbia's West Coast Operations Manager, "was our ability to push the MIP system to a 70-ft. depth at one location while avoiding cross-contamination of a deep sand unit." 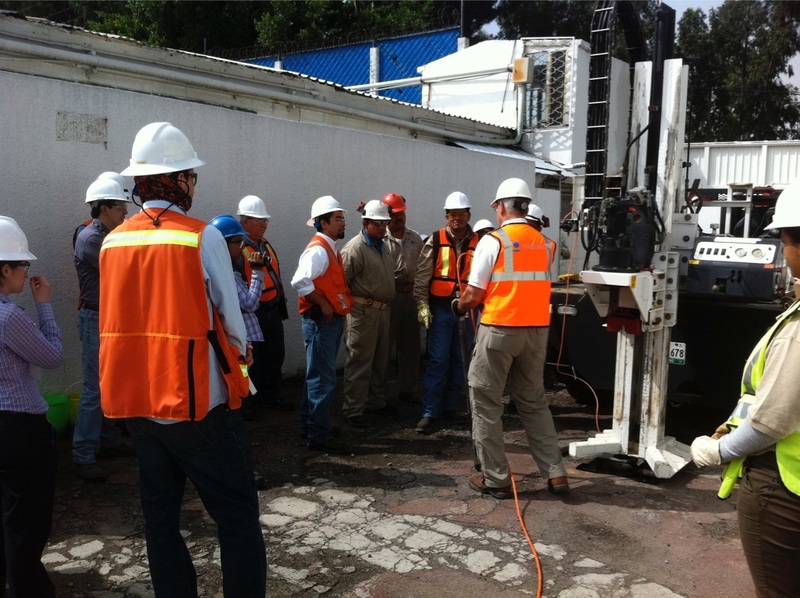 Lauren enlisted the assistance of Millennium Environmental in Anaheim, one of Columbia's southern California service partners, to provide a Geoprobe® 6600/PC111 and field team for the project. 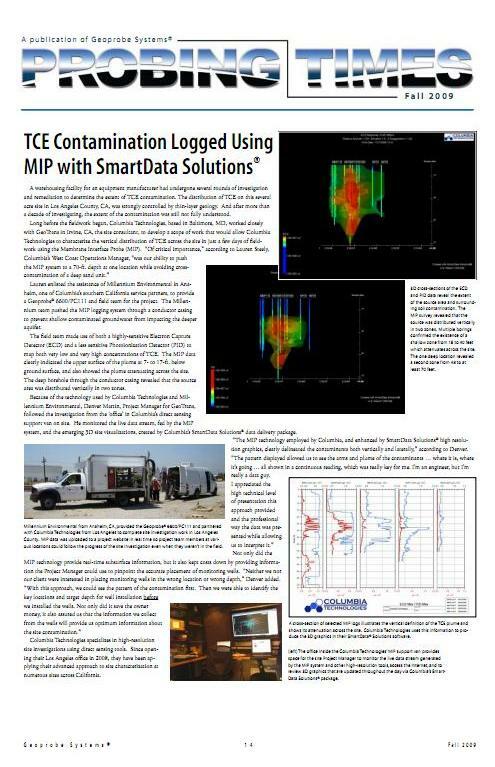 The Millennium team pushed the MIP logging system through a conductor casing to prevent shallow contaminated groundwater from impacting the deeper aquifer. A green company that saves businesses greenbacks. What could be better than that? Nothing, say executives at Columbia Technologies LLC. "We have a broad appeal," said Ned Tillman, president and co-founder. "Environmental types like us for our less invasive procedures, but businesses like us because we can save them a lot of money. We're in a pretty good position." The 6-year-old company has found a clean and fast way to measure subsurface pollution. While giving the environmentally concerned reason to cheer, Columbia is doing its share to keep commerce, particularly the real estate marketing, humming. "Real estate transactions can close a lot faster now," Tillman said. "Before, a lot of deals would fall apart because of the time it would take to find out if there was contamination on a property. With our technology you can know that in a day." The Catonsville-based company is now entering a growth phase. After spending its first three to four years engaged mostly in research and product development, the company has experienced "significant growth" over the past two years, according to Tillman. Business is expected to increase 15 to 20 percent annually for the next several years. Columbia currently does about $2 million in annual revenue and is profitable, CEO and co-founder John Sohl said.